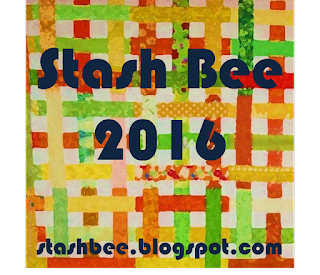 Sign up for Stash Bee 2016! As you may or may not know, I am the Bee Mama for the Stash Bee. and it's already time to start signing up to participate in 2016! This year was a HUGE success! CLICK HERE to access the sign up form. Hives will be announced in early December. Anyone not assigned to a hive will be placed on the waiting list in the order that they signed up. These are all three of my Stash Bee quilts! The last one is just a top and not quilted yet, but it's on my list of things to do soon! I'm excited to enter my Frame of Mind Quilt as my entry into the Fall 2015 Blogger's Quilt Festival! This quilt is very special to me because it was my first pattern for Moda Bake Shop and it is the largest quilt that I have quilted on my machine to date! 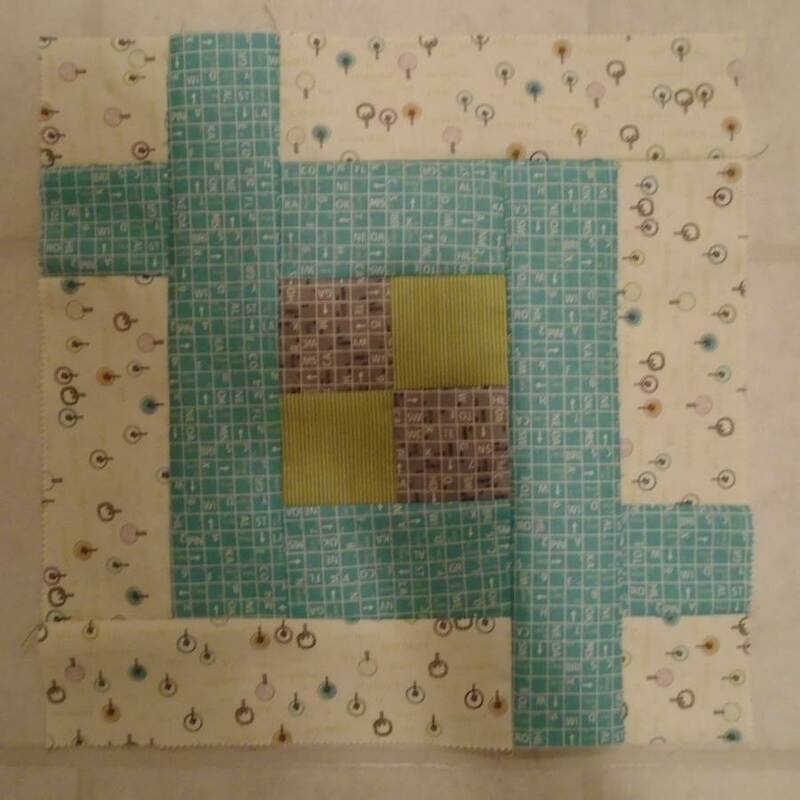 The quilt blocks are all the same pattern, but put together two different ways to get the puzzle/maze effect between the white background and the main fabrics. For the quilting, I did a chrysanthemum type motif where the center of each flower started with a swirl, and then I quilted layers of petals around the swirl. In the top picture, it almost looks like large pebbles but in the closer up pictures below, you can pick out the flowers. For those of you visiting for the first time, I do actually have a "little bunny" named Clara that is my quilt inspector. She was heavily involved in the making of this quilt. We luckily did not have a repeat of the incident where she tried to steal a charm square out of my scrap bin. This was a whirlwind of a quilt start to finish but I couldn't be happier with it and every time I use it, it cheers me up! Thanks so much for visiting and don't forget to check out all of the other quilts in the Blogger's Quilt Festival! It's hard to believe that it's October (and almost the end of the month at that) and I only have one more month in this year's round of the Stash Bee! But I am excited that sign ups reopen next week for 2016! This month, our Queen Bee asked us to make bookshelf sections. She was kind enough to send us background fabric to use too! I pulled out my bag of stringy scraps and went to work on two blocks. Of course I barely made a dent in my scraps, but I had a lot of fun putting these together and they are a great option for a bee quilt block! And that's all I am going to show until it's time for the BIG REVEAL! Short rant: HOLY WOW DOES THIS PATTERN HAVE A TON OF WASTE. This is my gigantic trim-off pile with pieces that I am going to absolutely SAVE and use in something else. I honestly could have trimmed my blocks almost an inch bigger than the directions instructed to do. Hope you're having a great week! 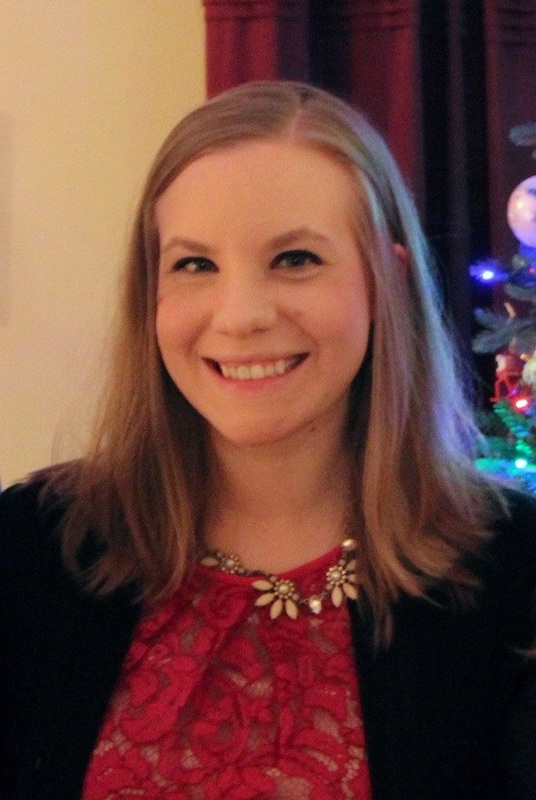 If you haven't already check out this GREAT POST by Jess of Quilty Habit regarding some things she's seen recently with companies not properly crediting quilters for their work. 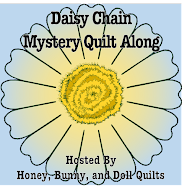 Linking up with Linky Tuesday, Fabric Tuesday, and WIP Wednesday! Like a lot of other quilty bloggers, right now I am working feverishly and semi-secretly on a test quilt for the Fat Quarter Shop's new pattern, Fireworks. I was able to pick which fabric line I wanted to work with, and I picked New Bedford by Denyse Schmidt for Free Spirit. The pattern is written to use two jelly rolls plus yardage. These rolls actually include some solids that coordinate with the line, but I won't likely use any of the solids in my blocks. This color palette is really out of my comfort zone, but I love all of the provincial feeling fabrics in this line! Here's a little secret/hint for you: I found that if I staggered my strips by ~1/2 inch as shown above, I was able to get 12 wedges out of a strip set instead of 10 as the directions indicate. It saves you a few strips! Hopefully you will see this pattern up on the Fat Quarter Shop Website soon -- and hopefully my quilt will be finished just in time! I took an unintentional break from paper piecing. Like a year long break. Which is really strange because if you've followed me for a long while, you know that I LOVE paper piecing. I made the whole Harry Potter Project of Doom quilt a few years back. In any case, after doing the Sew Kitschy BOM last year, I bought both the Sew Retro and Sew Retro 2 bundles to make a REALLY big Suzie Homemaker quilt. (Patterns all from Quiet Play on Craftsy and PayHip) Aaaaand then I made one or two from the Sew Retro bundle and put everything on the shelf for it to sit. So over the last few days and lots of playoff baseball, I made it thought a whole block! This one is three utensils. In progress shot! I realized that one of the reasons I must have shelved this project is because I needed more blues to work in. Just for scale, this block is 10.5 inches square. Lots and lots of little pieces for the spatula and the whisk! Hopefully this project won't be shelved for another year! But who knows with all those dang baby quilts I need to make. I was able to finish up all of my taffy blocks! Hooray! I'm not sure if I want to do any sashings or not yet. 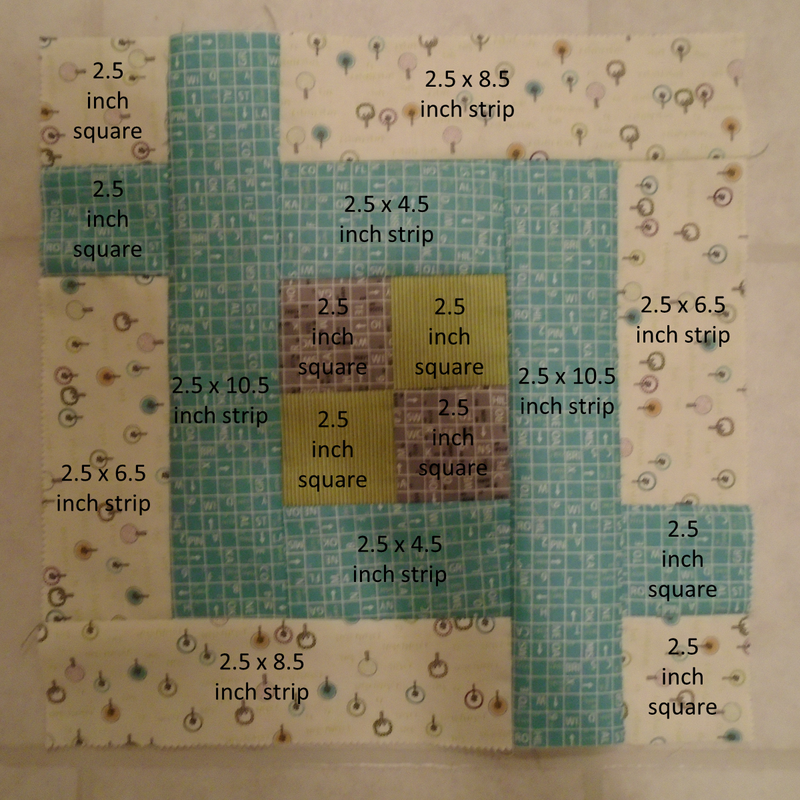 I'm thinking maybe to break up the blocks a little bit, but I don't want it to get too big -- it is a baby quilt! What are your thoughts? Since I finished one baby quilt, it was time to start another since I still have four on my list. Another boy quilt coming right up! I decided that I wanted to finally use the Salt Water Taffy quilt pattern from Moda Bake Shop from a long while back with a jelly roll of Road 15 by Sweetwater that I bought last year. Because it's just my nature, I decided to modify the pattern a little bit. Or a lot? I'm making the whole quilt from one jelly roll -- using the light strips for the background instead of solids. I also used some strips to make four patches for the centers of the taffy blocks since I don't have a matching charm pack. In my opinion, the original pattern has a lot of unnecessary seams, some of which are included to avoid having to use partial seams in the block. 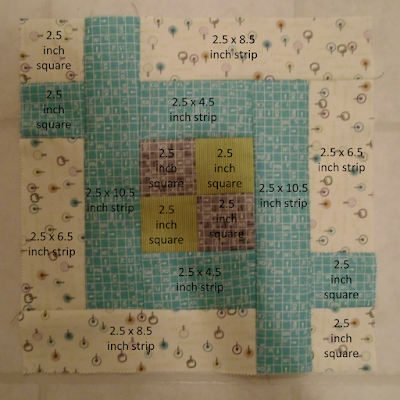 I'm all about the partial seam, quilty friends, so I set out to simplify the number of parts in this block. I know partial seams are anathema to some people, but I am all about simplifying seams and saving a little bit of fabric. I really like how all of these have turned out thus far! I have 3 green taffies and 3 dark grey taffies to make and then all of my blocks will be completed! I haven't yet used any of the black strips in the jelly roll -- I am thinking I will use them for sashing and/or binding. As I mentioned previously, I had started the quilting over the weekend and I was able to finish it up this week and then put the binding on. I did bias binding with one of the leftover fat quarters and juuuuust squeaked by having enough binding. But just barely! I quilted this one with light blue thread (the same as I had done in this quilt that uses the same fabric) and I used light blue flannel for the backing. I decided against doing some sort of border since it was already decently sized for a baby quilt. 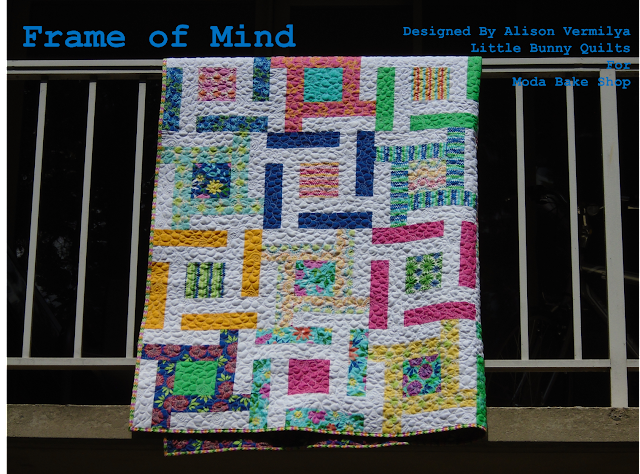 I did loop de loop quilting on this one and while I intended to do it on a larger scale, once I got started quilting, it ended up slightly smaller than I intended. It still looks good, I just need to work on enlarging my quilting. I'm not sure why the backing looks so teal in this picture other than I had to take pictures inside, but it's not quite that teal. One down, four more to start and finish! Linking up at Free Motion Mavericks and Finish it Up Friday!